19th Century young ladies (and gentlemen) learned a great deal about etiquette from their mothers, finishing schools, and from the societal expectations around them. The true art of conversation was a significant skill taught and expected within society, whether Philadelphia’s Old Money or the rural frontier. After all, conversation was a key element of an evening’s entertainment, courtship, and the Victorian Era’s social expectations. If you are conversing with people who know less than you, do not lead the conversation where they cannot follow. “Be cool, collected, and self-possessed, using respectful, chaste, and appropriate language. “Recollect that the object of conversation is to entertain and amuse. “Be patient. The foreigner cannot, perhaps, recall the word he desires; the speaker may be slow of speech; you may have heard the story a dozen times; but even then you must evince interest and listen patiently through. “Do not always commence a conversation by an allusion to the weather. “Do not, when narrating an incident, continually say “you see,” “you know,” etc. “Do not use profanity, vulgar terms, slang, phrases, words of double meaning, or language that will bring the blush to any person. “Do not intersperse your language with foreign words and high-sounding terms. It shows affectation, and will draw ridicule upon you. “Do not make a pretense of gentility, nor parade the fact that you are a descendant of any notable family. You must pass for just what you are, and must stand on your own merits. “Do not make a parade of being acquainted with distinguished or wealthy people, having been to college, or of having visited foreign lands. All this is no evidence of any real genuine worth on your part. “Do not use the surname alone when speaking of your husband or wife to others. To say to another, that “I told Jones,” referring to your husband, sounds badly, whereas, to say, “I told Mr. Jones,” shows respect and good breeding. “Do not attempt to pry into the private affairs of others by asking what their profits are, what things cost, whether Melissa ever “had a beau,” and why Amarette never got married. “Do not aspire to be a great storyteller. an inveterate teller of long stories becomes very tiresome. 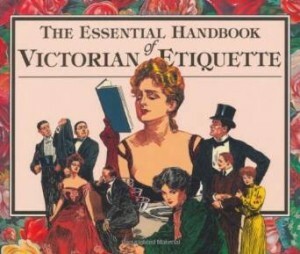 To tell one or two witty, short, new stories, appropriate to the occasion, is about all that one person should inflict upon the company.” The Essential Handbook of Victorian Etiquette, Professor Thomas E. Hill (compiled from his various publications between 1873 and 1890). Conversation is not to talk continually, but to listen and speak in our turn. … is most enjoyable when it reflects (but doesn’t sound just like) natural conversation. 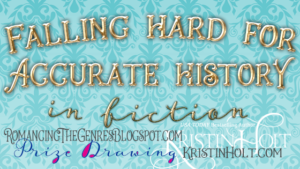 … is tricky for authors… because etiquette of the times (and locale) matter. … conveys so much more than simple discourse; dialogue reveals character, moves the story forward, and introduces new information to the reader (and that barely scratches the surface). … has a unique cadence, word selection, and pattern depending on the character’s gender, locale, education, and so much more. 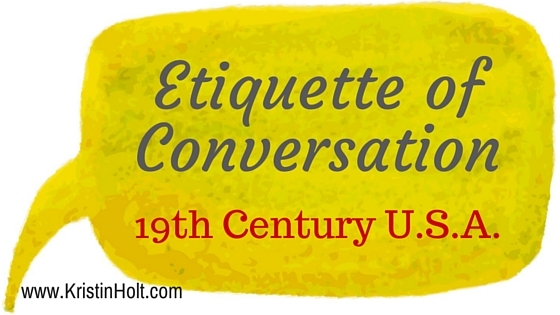 What conversation etiquette did your mother insist you use?